Yesterday I told you all about the Bijou Spun Himalayan Trail yarn from Bijou Basin Ranch. Today I have a pattern that is perfect for the yarn. 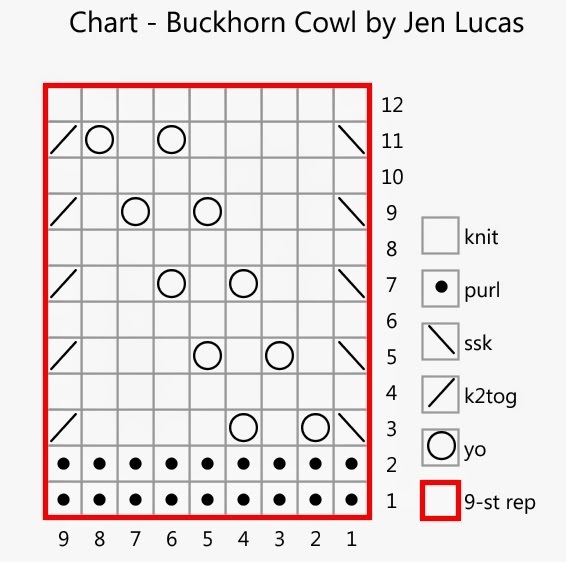 It's the Buckhorn Cowl! 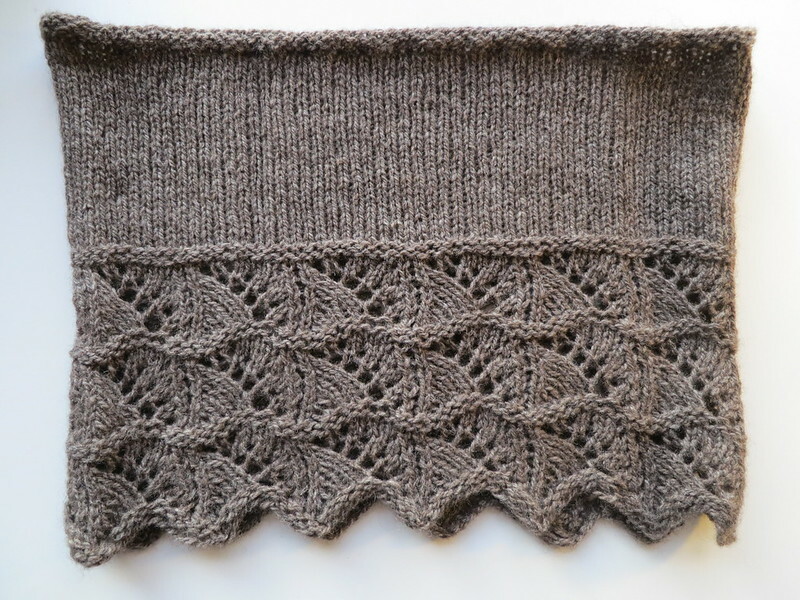 Gauge is not critical in this pattern, but a different gauge will affect yardage and size of cowl. 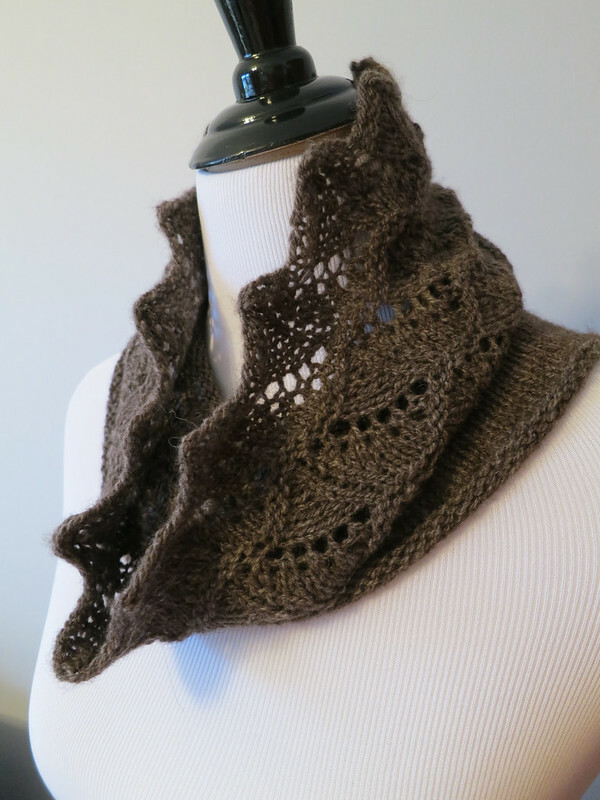 The pattern is written for the small cowl with the instructions for the larger infinity scarf size written in parentheses ( ), where necessary. If no parentheses are used, the instructions are the same for all sizes. If you would like to adjust the circumference of the cowl, just make sure you have a multiple of 9 sts on the needle. Remember, adjusting the stitch count will affect the amount of yarn needed! Cowl ends with two rounds of purl. It may roll a bit. If you don't want this look, you could work a few rounds of garter stitch (Rnd 1: knit; Rnd 2: purl) to desired length instead. CO 126 (252) sts. Join rnd, being careful not to twist. Place marker to mark start of rnd. Work Chart 3 times (36 rnds total). Purl 2 rnds. Work in St st (knit every rnd) until piece measures 8.5” from CO edge. Purl 2 rnds. BO loosely kwise. Block piece to dimensions given at the beginning of patt. With tapestry needle, weave in ends. Rnds 1 - 2: purl all sts. Rnd 3: *ssk, yo, k1, yo, k4, k2tog; rep from * to end of rnd. Rnd 4: knit all sts. Rnd 5: *ssk, (k1, yo) twice, k3, k2tog; rep from * to end of rnd. Rnd 6: knit all sts. Rnd 7: *ssk, k2, yo, k1, yo, k2, k2tog; rep from * to end of rnd. Rnd 8: knit all sts. Rnd 9: *ssk, k3, (yo, k1) twice, k2tog; rep from * to end of rnd. Rnd 10: knit all sts. Rnd 11: *ssk, k4, yo, k1, yo, k2tog; rep from * to end of rnd. Rnd 12: knit all sts. Rep rnds 1-12 for patt. Copyright 2015, Jen Lucas, All rights reserved. No part of this document or the related files may be reproduced or transmitted in any form (except for personal use), by any means (electronic, photocopying, or otherwise) without the prior written permission of the author.